Peninsular Railway 61 is a wooden, clerestory-roof, double-truck, double-end, interurban passenger trailer car. 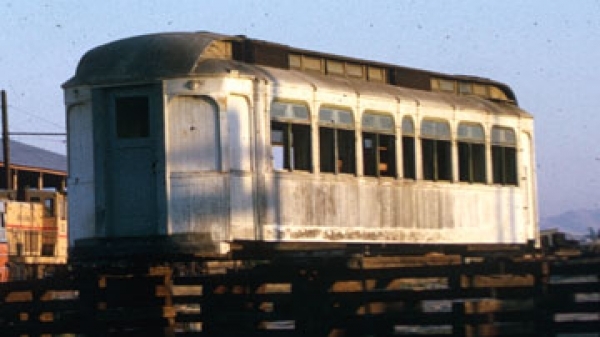 Car 61 was built in 1903 by the American Car Company for the Los Gatos Interurban Railway Company as their number 13. It was built as a trailer. The Southern Pacific consolidated the electric lines around the San Jose area into the Peninsular Railway in 1909. At that time the car was renumbered to 61. In 1931 car 61 was motorized using equipment salvaged for several of the motor cars, which were worn out. The car was converted to one-man operation about this same time. The system continued to lose money and passenger service was discontinued in 1934. The electrical and mechanical equipment was stripped from the car and the body was sold and was stored in a barn in San Jose until it was acquired by the Museum in March 1969. The car is currently undergoing restoration. Owners: Peninsular Railway 61. Los Gatos Interurban 13. Technical Data: Wooden interurban coach. Built by American Car Company of St Louis, Mo. In 1903. Seats 52 passengers. Total car weight. Trucks: (Brill 27MCB 2X). Wheels, (34 inch). Axle. Journals. Traction motors. Air Brake Equipment: Motorman’s valve. Emergency valve. Double check valve. Brake cylinder. Governor. Air compressor. Dimensions: Extreme width, 8’ 3”. Length over buffers, 47’ 6”. Height, 13’ 5 1/4”. Truck centers, 23” 10 1/2”. Truck wheelbase. Propulsion Equipment: General Electric type K. Controller, (K-35). Traction motors. Line switch. Power resistors. Misc Data: Trolley wheel. Trolley base. Whistle. Current Condition: This car is currently undergoing restoration. It was a stripped body. Proposed Future Treatment: Complete restoration of car. Trucks and motors are currently available.